What stresses your cat out? Cats who leave the security of their homes and go into public spaces are going to have some stress at some point. It is up you as the human to know the signs of a stressed-out cat so that she can be removed from the situation when the positive experience is outweighed by the stress she is experiencing. Learning the normal relaxed signals from your cat will help you pick up the the signs to watch out for in your cat that could indicate stress. 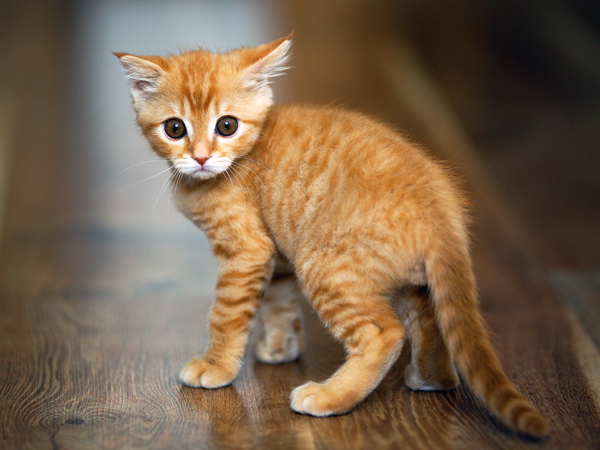 Your cat’s ears will point to the side and slightly forward when she is relaxed. When something catches her attention, they swivel all the way forward and perk upright, allowing her to try to gather as much sound from a direction as possible. If your cat is feeling stressed, her ears may twitch. 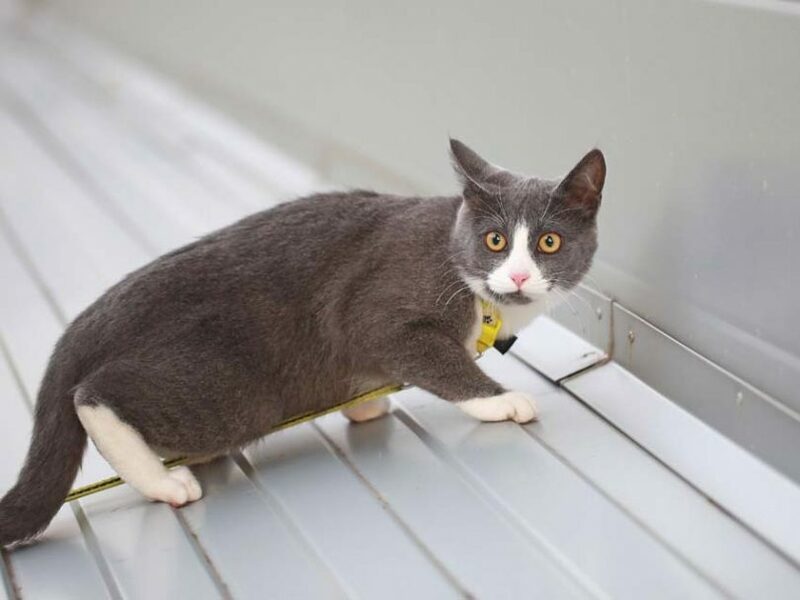 This can be very subtle and nearly impossible to see, but if your cat is especially frightened of something nearby, it can look almost like your cat is shivering. 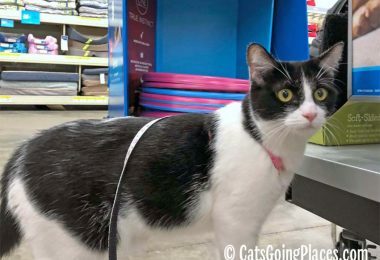 That’s a sure sign your cat needs some reassurance and to move away from whatever you have encountered during your outing that is so frightening. If your cat flattens her ears back against her head, she is frightened enough to go on the defensive. Be careful when trying to get her out of the situation, because she has gone into attack mode, and you don’t want to accidentally end up bitten or scratched by startling her further. 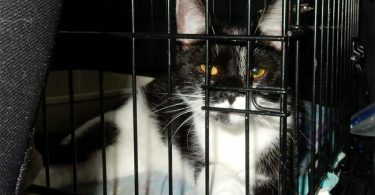 When your cat is in a good mood, her whiskers are usually held straight and slightly out to the side. This is a friendly or relaxed posture for them. When your cat is interested in something, the whiskers fan out and point more forward, as if they were reaching for the object of interest. This makes her whisker pads puff up. You see this when your cat is playing or finds something really interesting while you are out exploring together. When your cat is stressed or feels shy, she pulls her whiskers back along the sides of her face. This makes her look smaller and less threatening to other animals, and it may be a sign that the situation is a little stressful. A cat’s tail is one of the most reliable indicators of mood. An upright tail or one held upright with the top curled like a question mark communicate friendly, confident emotions. 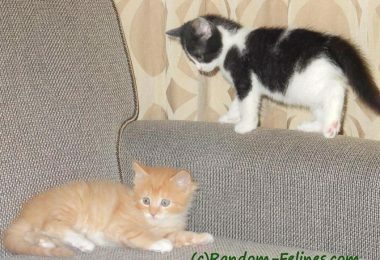 When that tail fluffs out and curls downward, watch out, your cat is feeling on the defensive. If you see this while you are out adventuring together, it’s time to take a break. A cat feeling stressed in a situation will carry her tail in a lower position or even curl it under her. 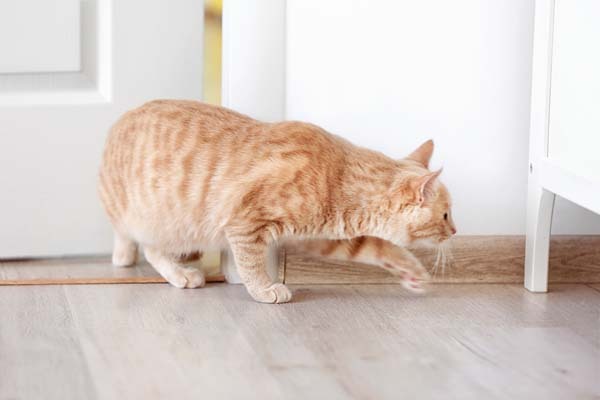 A cat who swishes her tail isn’t wagging it like a dog; she is often showing that she’s annoyed and would prefer not to be approached by strangers right now. A relaxed cat keeps her claws retracted. She moves around in a natural, relaxed way. 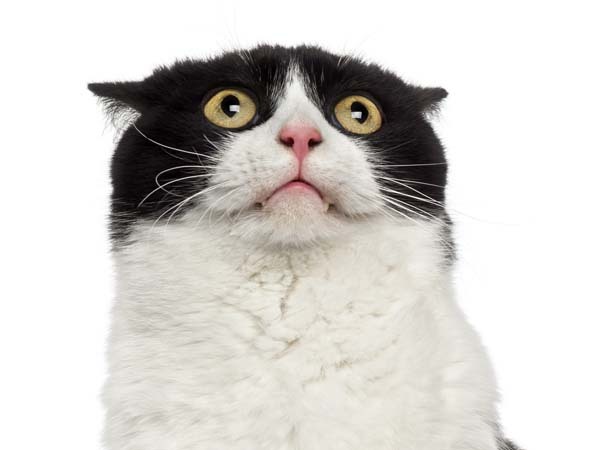 If your cat gets stressed, she may move more slowly, like a slow-motion version of herself. If she walks, it may be slinking low to the ground, as if she is trying not to be noticed. That’s exactly what her instincts tell her to do! Instead of going on slow-motion, a stressed cat may also go really fast to try to get away from the situation. This is an important reason to be aware of body language, so you don’t lose your cat if something frightens her. When your cat is relaxed, her breathing is usually slow and regular. These deep, even breaths are a familiar sight when your cat is sleeping or lounging contentedly. If she is feeling stressed, a cat’s respiration rate gets faster. Keep in mind that stress, in this case, may come from feeling nervous about a situation or about the environment itself. Being out in the heat can make your cat breathe faster, too, which is a form of stress to watch out for. After all, your cat is wearing a fur coat! 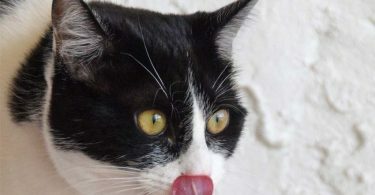 You normally don’t see much of your cat’s tongue unless she is eating, drinking, bathing, or yawning. Cats feeling stressed may lick their lips. 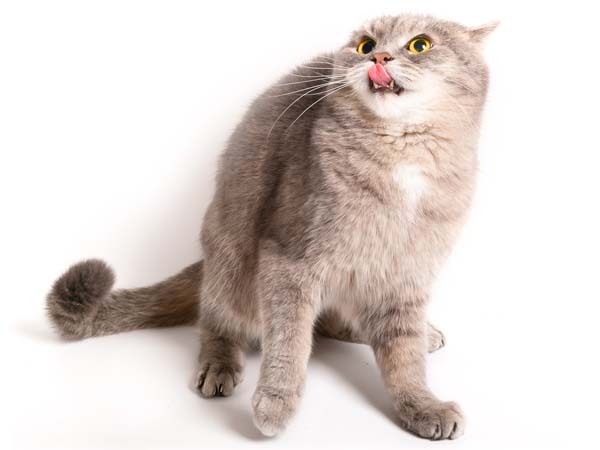 Of course, there are other reasons cats lick their lips, including anticipating a tasty treat, feeling nausea, or experiencing a health issue such as dry mouth. 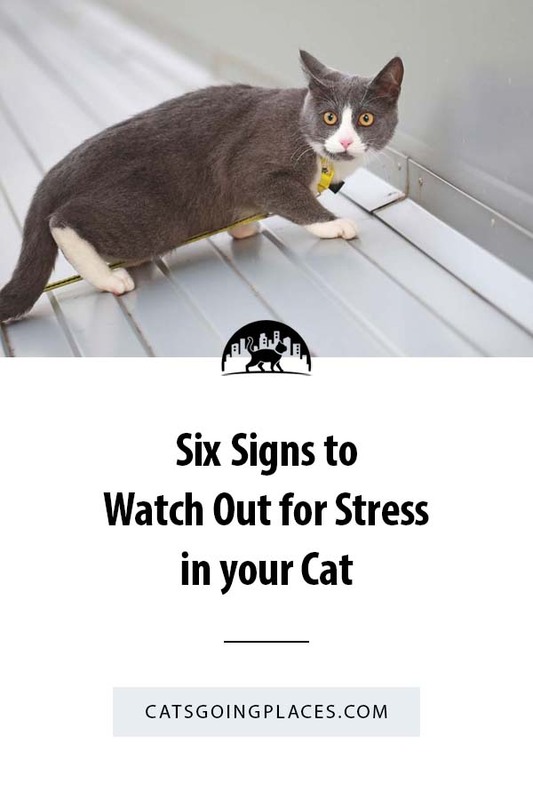 It’s a good example of how you should look at all of the signs your cat gives off to help you detect stress before it becomes a problem rather than assuming any one sign is guaranteed to identify a stressed-out cat. 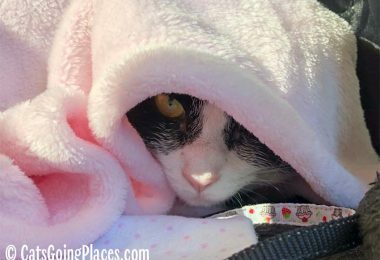 Paying attention to the little signs that your cat is feeling stressed and assessing whether she needs a break are important for the two of you to have rewarding outings together.  Your cat will be more excited about the next outing when the previous one wasn’t too stressful. My human monitors me all the time for signs like these. Usually I have my happy tail on, but if she is worried I’m starting to stress, she offers me a treat. Usually it makes me forget I’m stressed, but if I only lick it, or refuse it altogether, she knows she needs to make me feel safe.